A receipt for a 1929 Renault purchased at George Newman & Co.
Homepage. This page: A receipt issued to a Mrs Victor Ford by George Newman & Company Limited, of Euston Rd, London. 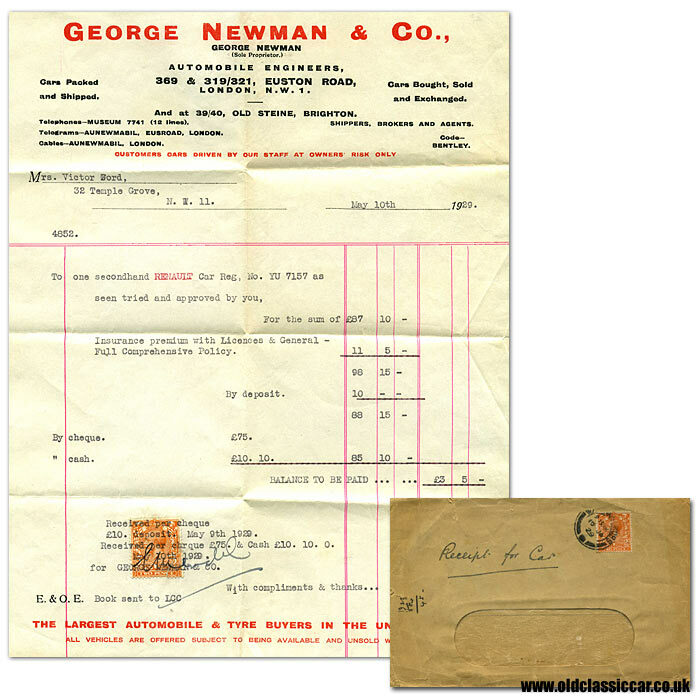 Purchase of a 1929 Renault at George Newman & Co. Ltd. This receipt was typed out on May 10th 1929, and was sent to Mrs Victor Ford, of 32 Temple Grove in London. It related to a recent purchase of a secondhand Renault motor-car, registration number YU 7157. The total cost of the car, including full comprehensive insurance, amounted to £98 15s. A deposit of £10 had been paid on May 9th, with a cheque for £75 and a further £10 10s being delivered the following day, leaving just a small sum outstanding. Unfortunately the model of Renault isn't given. However, the YU registration series was only used for a very short time in London, from September 1927 through to January 1928, so this suggests that the car was probably a 1927 Renault. Vintage Renaults featured the 'coal scuttle' bonnet, and in the late 1920s there was a large range of cars on offer from this French motor manufacturer. In 1928 for example, there were seven different models, ranging from small cars such as the 6CV and 10CV, through medium-sized machines like the Monasix and 15CV, with the range being topped off with the Vivasix, 18/24CV and the 40CV. The smaller Renaults tended to find more buyers, so chances are that YU 7157 was one of the lighter-weight models. Female motorists in the 1920s were less than a common sight, and those that did buy their own motor-car, tended to opt for the smaller types. The Renault was sold by George Newman & Co. Ltd. of 369 & 319/321 Euston Rd, London NW1 (the company also had an outlet at 39/40, Old Steine in Brighton). From what I can find out, Newman & Co. dealt in a variety of makes and models, with evidence of Rolls-Royces having also passed through their showrooms. It seems that they were also agents for Land Rover in the post-war years. More motoring memorabilia can be found in the collectables section of the oldclassiccar site. A photo of a later, mid 1930s, Renault Primaquatre can be seen here, in the vintage photos section.